Our 2018 top selling flower seeds! Actinidia arguta Issai is a self-fertile variety of the mini-kiwi. Unlike the species it does not need a male and a female plant to produce fruit. It bears smooth-skinned fruit of the same taste and shape like kiwi but smaller to 4 or 5 cm. They are green and ripen gradually from the end of September until end October and the sweetest when picked after they have softened a little. 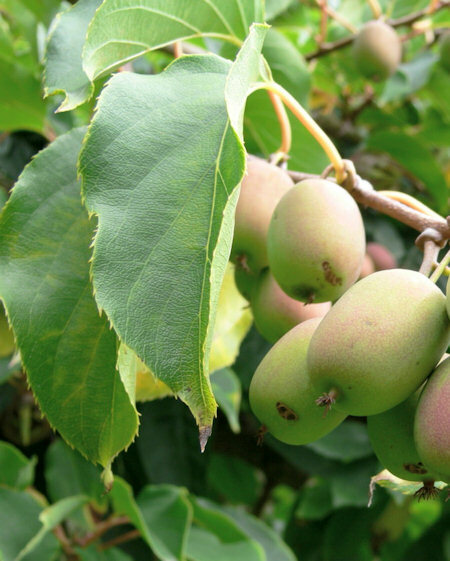 Kiwis need a sunny and warm site with semi-fertile, acidic, fresh soil. This variety is a small vine than the normal Kiwi and was bred to sustain frosts of up to -29°C - even that should be enough for our recent winters! 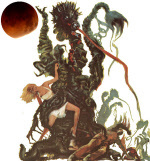 From experience the plants may take quite a few years to reach fruiting maturity. Always wanted to grow your own tea and coffee? 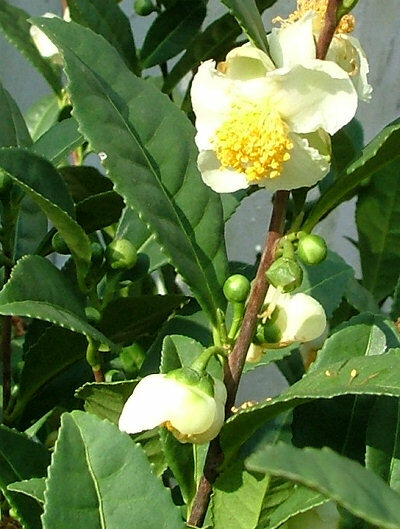 Well here’s your chance, with this plant grown for tea in Sri Lanka and India. Camellia sinensis is a member of the Camellia family with white flowers preferring warm damp conditions but no frost. I have read that the first commercial tea plantation is being considered in Cornwall now taking advantage of Global warming. Such a well known commodity! But did you know that Coffee arabica make interesting house or conservatory shrubs with dark glossy green leaves, small white scented flower clusters followed by bright red coffee beans. Don't get too excited though about grinding your own coffee from the seed - it tastes awful if you do not dry it correctly! 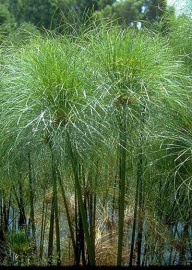 Cyperus papyrus or Egyptian papyrus reed produces the original paper made from the crushed and pulped stems. Easy to grow reaching 6ft to 7ft when mature. In the first year it makes a more manageable 3ft and is easy to grow from seed. Remember that it is a water reed and ideally will need to be left standing with the pot in tray of water. 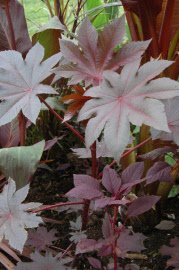 A decorative plant that we often grow as part of our summer bedding in a tropical border. The Ensetes are a separate species and only a relative to the Musa family, bearing strong attractive light green to grey green stiff leaves, some with a red mid rib and white bloom to the reverse side of the leaves. The plant shown depicts a 2 year old Ventricosum plant in July after over wintering in a frost free Greenhouse. I have been growing these from seed for many years now so that I always have older plants for a continuous dramatic display, after that they just get too large! Leaves are not frost hardy but suffer minimal damage down to 0°C or minus 1°C but the root system can take up to minus 5°C if protected. Usually the plant would be dug up and kept on the dry side in a frost free environment until the following year. (A frost free conservatory is ideal!) 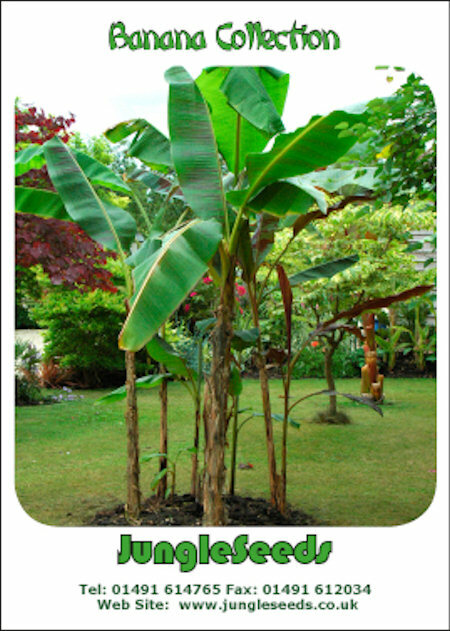 I have had some success with larger plants by digging them up, lightly trimming the roots, placing into a large pot, cutting off the main trunk and allowing it to regrow. 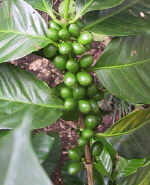 The seed grows readily though if fresh in a temperature of 27°C to 30°C. This interesting small shrub also known as Acca sellowiana will take some frost to perhaps -8°C, therefore fully hardy in some gardens. In mid summer Feijoa sellowiana bears unusual large dark red flowers and if you grow two plants together, they will cross fertilise to bear delicious “guava” flavoured fruits. Hedychium gardnerianum is a spectacular plant and in a large clump with several flowers the effect is stunning with a scent almost overpowering. Flower heads are about a foot tall and some 6" across, yellow with red stamens on top of 5ft stems. I have not met anybody who hasn't fallen in love with this plant when shown a specimen in full flower. Monarda an old favourite of ours in our cottage garden is a durable, showy garden plant for the perennial border and an interesting cut flower with stem up to 60cm. 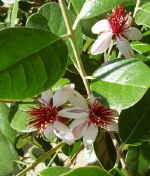 A tea from the spicy leaves of this plant is known as Oswega Tea and the petals are also edible in salads. 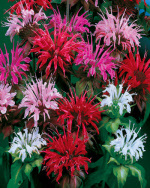 This special mixture of Red, Pink and Salmon shades makes a wonderful addition to any garden. Easy to grow and fully hardy. 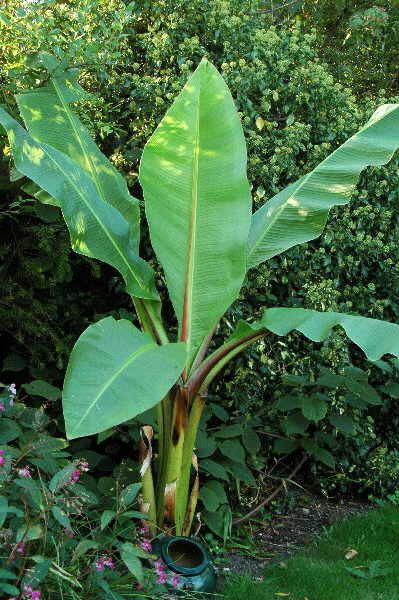 Musa sikkimensis is still a relatively new plant introduction to the UK proving to be as hardy as Basjoo, but I think more attractive. 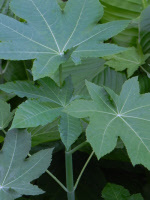 The leaves are a darker glossy green, with new leaves producing a lovely pink flush to the underside as they open up. Some seedlings have markings almost as striking as Zebrina, and quite spectacular as a large plant. 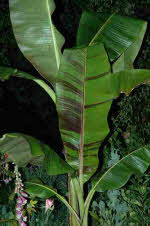 (We source our seed only from plants showing strong red markings growing wild in the Himalayas.) Since Musa Basjoo cannot be grown from seed, this hardy alternative grows quickly, and once established can be further propagated by suckers. 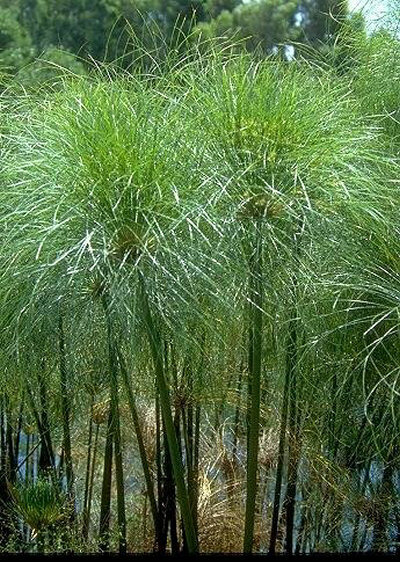 Originating from 6,000ft in the Himalayas, it is tolerant to frost at the roots. Good resilience to wind, and continues to grow in cool weather when Basjoo halts. Fairly easy from seed at 30°C with about 50%+ germination rate, and easier to over winter under cold glass than Basjoo from my experience. We believe this to be a form of Zanzibarensis. From our trials the produced tall plants to 10ft in a year with attractive blue/grey leaves and stems. The seed capsules are also a grey green. 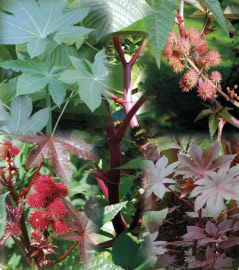 Ricinus Carmencita Red, a superb selected form of Ricinus with brighter red seed heads and deep red/bronze shiny leaves. An outstanding plant. Please note that this plant only produces strong leaf colour when in full sun and as it matures above 2ft. 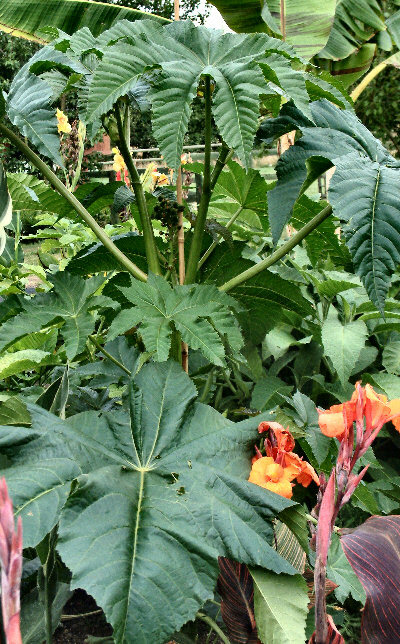 Ricinus communis zanzibarensis has huge green leaves and is capable of reaching 10ft in one season, supporting 2ft wide leaves. Great for an unusual green jungle back drop. We now supply a mixed colour form, some with plain green stems and some with a hint of pink similar to a giant form of Carmencita Pink but without the Carmencita pink flowers. 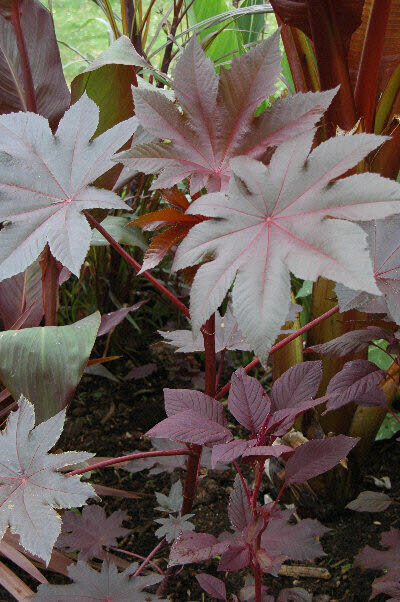 Ricinus New Zealand Purple is a fabulous new Ricinus with deep maroon to purple metallic leaves, stems and fruit. 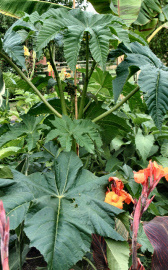 A tall, majestic plant to 7ft with stunning foliage and a must have for any tropical border. We now have sensible quantities for sale. Please note that the seeds need a little more heat than other Ricinus to get them started. Tithonia speciosa Torch develops into tall 5’ to 6’ tall sturdy plants with velvety dark green leaves and fiery, red-orange blooms will turn any sunny spot into a Mexican fiesta. Perfect for use as a quick summer screen they also attract butterflies. 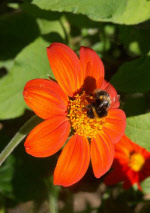 Heat and drought tolerant and will grow in any soil as long as it is in full sun. Zinnia Benarys Giant Mix produces fully double giant 4" to 5" flowers on long stems excellent for cutting. A winning tall variety growing to 3ft or 4ft with large dahlia like flowers and a proven superb variety. 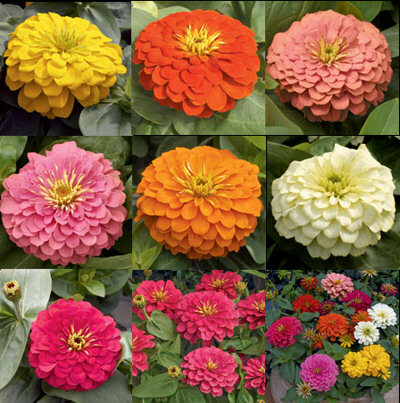 Colours include crimson, yellow, purple, rose, lilac, orange and white.